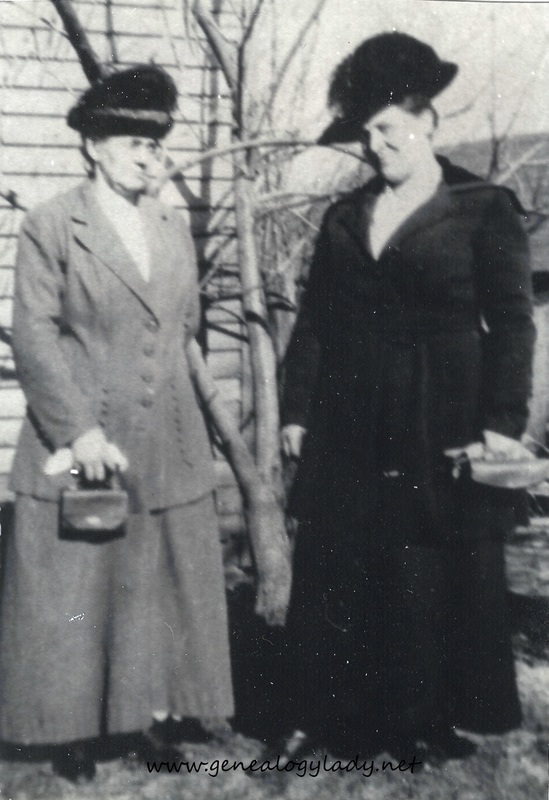 Lovina (Schiele) Yegerlehner and Susan (Schiele) Schwartz, on the Yegerlehner farm, Clay County, Indiana, late 1910s. Photograph from the collection of the author, Deborah Sweeney. This entry was posted in Schiele, Wordless Wednesday, Yegerlehner and tagged Clay County, Lovina (Schiele) Yegerlehner, Susan (Schiele) Schwartz, Wordless Wednesday on November 13, 2013 by Deborah Sweeney. CLAY CITY, Ind., Feb. 14 – Mrs. Elizabeth Schiele, aged 78 years, died very suddenly of heart disease, at the home of her daughter, Mrs. John Yeagerlehner, near Clay City. The deceased was a widow of the late Michael Schiele, a prominent farmer of Harrison township for many years. 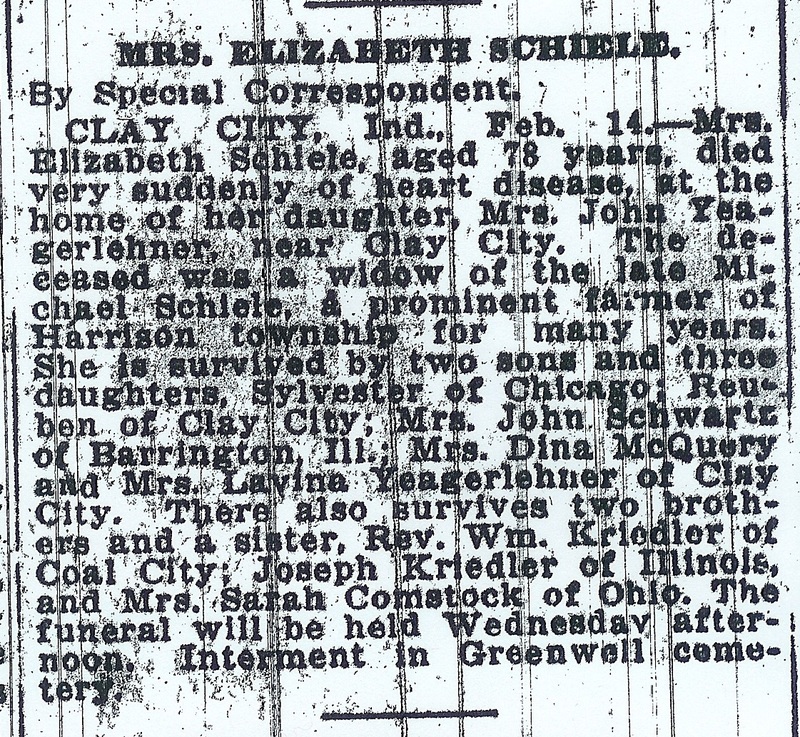 She is survived by two sons and three daughters, Sylvester of Chicago; Reuben of Clay City; Mrs. John Schwartz of Barrington, Ill.; Mrs. Dina McQuery and Mrs. Lavina Yeagerlehner of Clay City. There also survives two brothers and a sister, Rev. Wm. Kriedler of Coal City; Joseph Kriedler of Illinois, and Mrs. Sarah Comstock of Ohio. The funeral will be held Wednesday afternoon. Interment in Greenwell Cemetery. Elizabeth was the daughter of Isaac and Anna (Haldeman) Krieble. 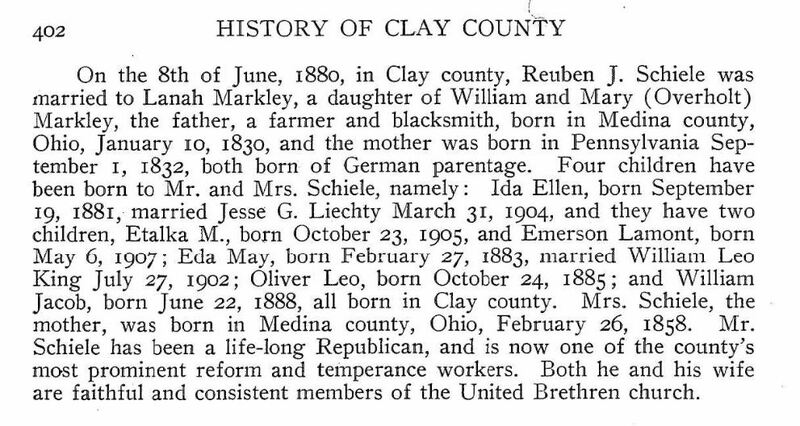 She was born on 3 April 1844 in Pennsylvania, possibly in Worcester Township, Montgomery County. She was the tenth of thirteen children. 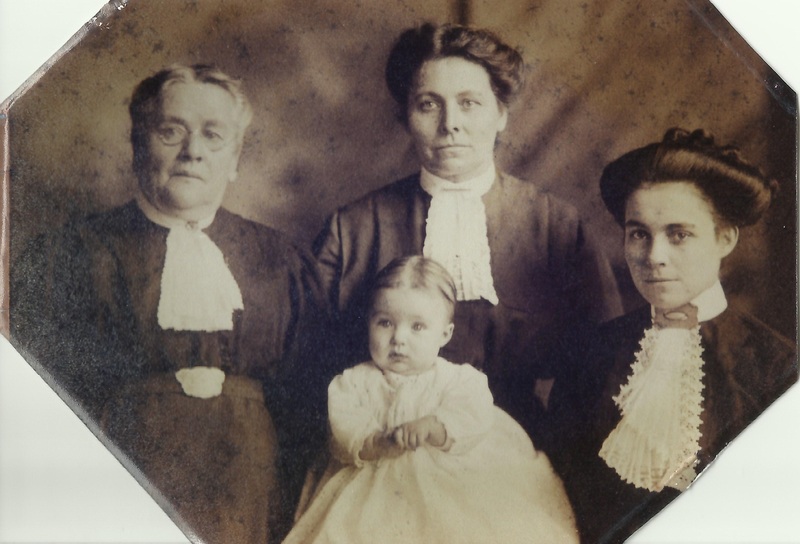 Within the next few years, the family moved to Montville in Medina County, Ohio. By 1860, the family moved again, this time settling in Owen County, Indiana. Elizabeth had a relationship with a man named James McCoy, whether as a married couple or not is unknown. Elizabeth gave birth to her daughter Nancy on 16 April 1866. 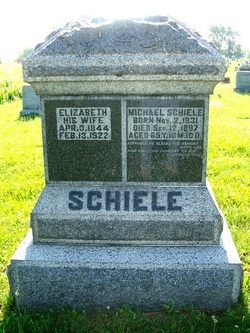 Ten months later, Elizabeth became the second wife of Michael Schiele. Michael and Elizabeth were the parents of eight children: William, Sylvester, Doretta, Susan, Lovina, Nathan, Andrew and Charles. Michael died in 1897, leaving Elizabeth a widow for almost 25 years. 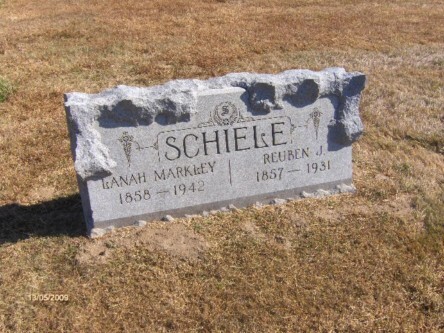 They are buried together at Greenwell Cemetery, Harrison Township, Clay County, Indiana. 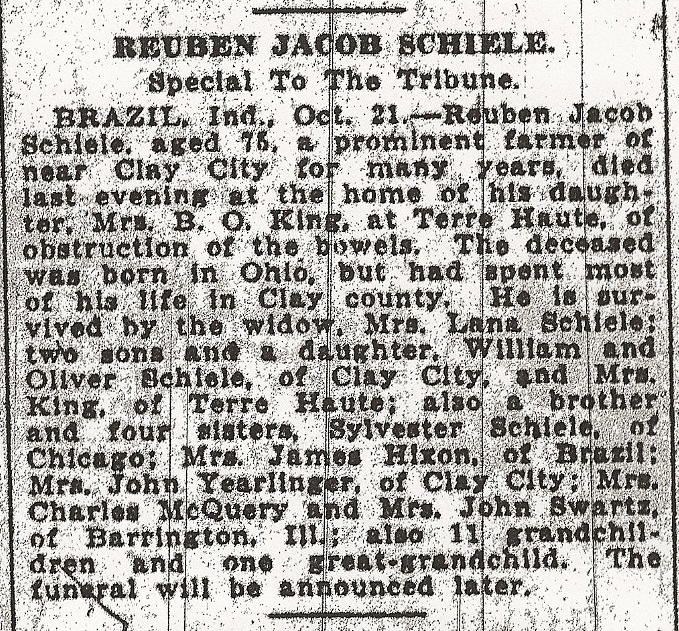 This entry was posted in Genealogy, Sunday's Obituary and tagged Anna (Haldeman) Krieble, Doretta (Schiele) McQueary, Elizabeth (Krieble) Schiele, Isaac Krieble, Jack Fouts, Joseph Krieble, Lovina (Schiele) Yegerlehner, Mae (Walker) Fouts, Michael Schiele, Nancy M. McCoy Schiele, Reuben Schiele, Rev. William Krieble, Sarah (Krieble) Comstock, Silvester Schiele, Susan (Schiele) Schwartz on October 27, 2013 by Deborah Sweeney.